Note: This article was originally shared on Sept 2nd, 2012 with the title “Why I Hate Emotional Freedom Techniques”. This is an updated and edited version of that article. I have a confession to make. I hate Emotional Freedom Techniques. OK, I don’t hate the tool, but I do hate the name. In the beginning I hated the name because I thought it did the technique such a disservice. Here we were being given this amazingly powerful tool that was changing people’s lives. It was helping them to release lifelong limiting beliefs, ameliorate chronic physical pain, ease deep-seated emotional issues, and eliminate cravings. It has brought relief to people in hospitals, in war-torn countries and disaster zones, and in prisons. 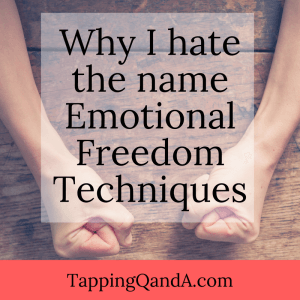 As a professional using EFT I thought the name “Emotional Freedom Techniques” undermined just how powerful a tool it is. As someone who has used tapping for many years, I know what that freedom feels like after a powerful tapping session. The world feels new because we have released what has been holding us back. But this is the language of someone who has used EFT and experienced its benefits. For those who haven’t used it before, it is easy to perceive EFT as something frivolous and unpowerful. It wasn’t just the fact the name was undermining its power, but instead the name wasn’t accurately describing what was going on. His comment made me think about the way I teach tapping. Over and over again I teach that emotions are not the problem. Emotions are not the enemy. Emotions are information. Every time we feel an emotion, our system is just giving us information. When I feel sad, it is saying that something important is missing. When I feel angry, it is telling me that it perceives attack. When I feel frustrated, it is letting me know I am not getting what I want. This information is both helpful and useful. The goal of tapping isn’t to be free of these emotions. First, the goal of tapping is to make sure that emotions show up at the right time. For example, it is right that I fear lions, but if I fear them so much that I can’t leave my apartment in Brooklyn because I know there is a lion ten miles away in the Bronx Zoo, then that fear is completely out of proportion. Second, the goal of tapping is to make sure emotions are showing up to the right degree. For example, when someone cuts me off on the highway the rush of adrenalin triggered will help sharpen my senses and help me to control the car and stay safe. If that rush goes on so long that it overwhelms my system and I end up on the side of the road crying for 45 minutes because I almost died, the reaction produced is out of proportion. I want and need my emotions. They are an important part of how I navigate the world. I don’t want to be free of them. I have arrived at a point where I mostly just call what I do tapping, because I don’t tap in exactly the way Gary Craig originally taught. But again, that is less important. I know that if I tap regularly on my emotions, issues, and beliefs, then that will happen. If that happens, then it doesn’t matter if we call it tapping, EFT or Chad. It only matters that I am living the life I want. Best I can do is Emotional FLOW Technique. Can anyone come up with something better? I agree that the name ‘Emotional Freedom Technique’ can be confusing or misleading to someone considering practicing Tapping techniques. As an energy practitioner and yoga teacher, I never that name to my students, I always simply call it ‘Tapping’. 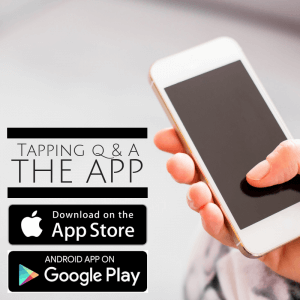 I explain the energy pathways; how Tapping works; the benefits of practicing it. However, if you are looking for a more suitable acronym, how about EWT – Emotional Wellness Tapping? Same acronym- new words- Yes! It’d have to be something with E-verything! I agree with you that it is not a very nice sounding name and when you say EFT to someone they think you are talking about Electronic Fund Transfer. We should see what names people come up with although I think it is a bit too established to change it. But then again – Emotional Freedom is just that – freedom to feel and allow all sorts of emotions in a balanced way. Yes, I think Sue got it right, –and, using the NLP distinction, are you moving FROM or are you moving TO ? And then the ‘freedom’ might be thought of as freedom from stuck-ness and freedom to choose! Freedom to create your new life. From my point of view the name EFT expresses freedom from the negative and crippling effects of our emotions not elimination of emotions. What it’s called doesn’t matter. It works, it’s simple, so why complicate it. Live with it or tap on it. Living with negative emotions and limiting beliefs that controls your decisions you make or don’t make in life is like living in “prison” . 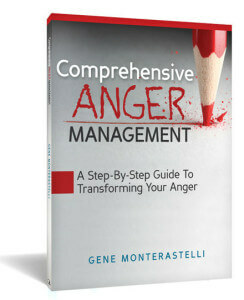 When you deal with your negative emotions and eliminate them (of course not all of them! only the ones that prevents you from living a full and health life) it’s like leaving your own “prison”. Therefore – to my opinion – i can’t see any problem with the title “Emotional Freedom”. I must say that your article itself is excellent!! If you think of ‘freedom’ meaning ‘freedom from’, then you have a point. But if you think of freedom in the sense of ‘freedom to’, then Emotional Freedom Technique is a good label. ‘Freedom to’ is much like freedom of speech, the right and ability to make one’s self heard, to express; it is not usually meant as freedom from speaking. To process emotions ably and share them with others when appropriate, to live and grow with them, is well called Emotional Freedom, and tapping is a technique for having that freedom. I don’t see your point. If you don’t like the name, why use it? Many people use different tapping tecniques, that use elements from EFT, and also blend it with other techniques, but almost everybody call it Emotional Freedom Techniques (EFT)! 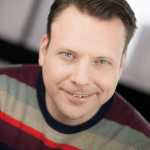 So my suggestion to you, is that you find another name (and please don’t use the acronyme EFT – that would be to misguide people) that you feel will better describe your technique. Emotional Freedom Technique … for me, the name evokes the possibility of gaining a freedom from portions of my life where my lived experience was more like imprisonment. Being able to feel, own, describe, process, integrate, learn from the Truth of my emotions has not been an easy journey … but certainly worthwhile and most certainly a Freedom so longed for. Limiting beliefs and stinking thinking hold so many captive. Whatever affords us hope for a fuller, richer life is such a blessing … EFT and practitioners like Gene … Thank You!